A Guide to Horse Saddles and the saddles use in each riding discipline. Your horse saddle is of prime importance in every aspect of your training schedule. Not only must it fit your horse perfectly, but it must also make you feel comfortable and secure. There’s no use having the most expensive flashy horse saddle if neither you nor your horse feel good in it. An ill fitting saddle can cause your horse pain, which can then lead to your horse resisting your aids. Loose fitting tack may fail to convey a signal to your horse, or in a worst case scenario may come off altogether and cause a serious accident. If you have any doubts about the horse tack or equipment you are using consult an expert. For a full appreciation of the importance of your horses saddle read our History of the Saddle. In an ideal world every rider could afford to buy a saddle that had been individually tailor-made for them and their horse, with the riders weight, shape, gender and length of leg factored in. A bespoke saddle with the tree and under panels of the saddle being contoured to fit the horse. But this is rarely possible for the average rider. The alternative is to go back to the pad type saddle, and that is precisely what has happened. The vast majority of horse saddles are manufactured using leather. Leather saddles are designed to provide comfort for both the horse and rider and to last a lifetime. However, qualified saddlers are becoming rarer and rarer and the purchase of a good synthetic saddle should be considered, if you’re on a tight budget. Consider all your saddle options and make sure you choose the correct size and type for the sort of work you want your horse to do. What kind of riding you choose to participate in will determine what style of horse saddle you buy. Where the stirrup bar is in relation to the deepest part of the saddle will influence where your leg hangs below it. The farther forward the stirrup bar the more in front of you, your leg will be. English Saddles are measured from the button on the front of the saddle to the center of the cantle. The measurements are usually in inches, with children?s saddles from 12" to 16" and adult saddles from 16" to 19" varying every half inch. A correctly fitting saddle will leave you room behind your bottom, measuring about the width of your hand. Be sure that your knees do not pass the front of the flaps when your feet are in your stirrups. General or All-purpose saddles are usually designed this way. It is a far more protective, defensive riding position. It takes longer to fall off forward if your leg is parked out in front of you. No matter how hard you try you will not be able to put your leg under you for a proper equitation position in an all-purpose saddle. Riders on all-purpose saddles generally ride with shorter stirrups. The flaps on all-purpose saddles are set farther forward in order that your knees do not stick out of the flaps. Riders compensate for this by leaning a bit more forward to balance. 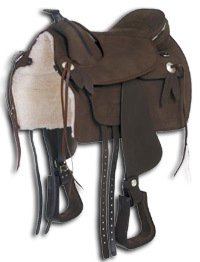 This type of all-purpose horse saddle usually has a round cantle, a deeper seat and knee rolls. 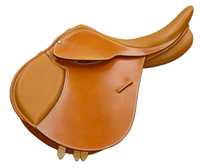 All-purpose-saddles are used mainly for trail riding, recreational riding, fox hunting and cross-country horseback riding. These kinds of saddles are comfortable for long rides. In contrast, dressage saddles have the stirrup bars directly under your seat. This allows your leg to be open at the hip, almost standing while riding. 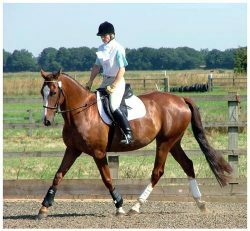 Dressage riders sit far more upright than any other English rider and need to have as much leg as possible against their horses. The flap of the dressage saddle is straight down from the stirrup bar. This style accommodates a longer stirrup length and a straighter leg. Deep seats, round and high cantles, as well as long flaps, characterize dressage saddles. 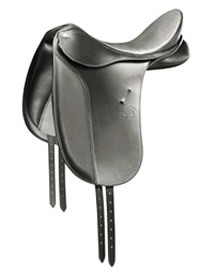 In between the all-purpose horse saddle and the dressage saddle sits the close contact style saddle. These saddles are designed for classic equitation. The bodylines that determine this are your Shoulder ? Hip ? Heel & Knee ? Toe. What this means is that when you are seated in the saddle on your horse, you will be able to draw a straight line from your shoulder through your hip and down ending at your heel. You will at the same time be able to draw a line from the front of your knee to the tip or your toe. The close contact saddle stirrup bars are installed to make proper equitation possible. Close contact saddles can have plain flaps or padded flaps. Under these flaps you may find knee and/or thigh blocks. Knee blocks help keep you mounted when your horse spooks, stops at a fence or wheels around. The thigh block helps you recover your balance when you fall forward and gives you time to push back into an upright position. It does not affect equitation either way, most of the time you will not even know a knee block is there. Thigh blocks prevent your leg from slipping back under your body. Formulated for topiramate price list longterm use in painful inflammatory muscle and joint..